DADDY DON'T GO tells the story of 4 fathers struggling against poverty to be good fathers for their kids. There are many statistics in the movie, and one is that 1 in 3 kids grows up without a father. 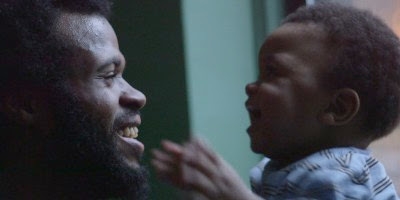 These men are fighting to be fathers against their hard lives. We have Nelson who is a father to 3 children, 2 girls who are his girlfriend's children from a previous relationship, and the other is his own child from another relationship. He wants to be a good father to the two girls despite the fact that he is not their biological father. He really loves the children. They have money issuses and he has had difficulty finding work. Alex, is a single father and has custody of his child, but is facing the possibility of going to jail. Roy and his son left his girlfriend , because he said she wanted to party too much, which he knew wasn't a good enviornment for their son. He also has trouble finding work because of a prior conviction. He lives with his family who help him out. Lastly, we have Omar, who is also a single father who took his children away from an abusive mother, who is now in jail. He and his children have some metal disabilities. The film plafamilys tonight at DOC NYC and again on Tuesday. For tickets and more information go here.